Along with the Mercedes G-Class, the Land Rover Defender was one of the longest running automotive nameplates to continue without a major refresh. The old Defender began production back in 1983 and even that model could trace its roots back to the Series I car of 1948. For the first time ever, a radical new Defender is on its way and it doesn't take an automotive expert to see it won't be exactly like the original. The new Defender will be far more modern and livable while attempting to retain the rugged character that made it popular in the first place. Speaking with Trucks.com's Ryan ZumMallen, Land Rover North America, opened up about how it plans to revitalize the Defender without abandoning the SUV's roots. "The new Defender will retain some of the original appeal,” Joe Eberhardt, chief executive of Jaguar Land Rover North America said. "But it’s a vehicle you can drive every day for as long as you want as opposed to the old Defender.” The old Defender was brilliantly simple and utilitarian, making it the ideal choice for off-road enthusiasts, explorers, and even the British army. We've driven the original Defender and although its off-road capability is indisputable, we wouldn't want to drive it for long distances. Compared to the old Defender, the new car appears like it will be a highly capable SUV with a more livable cabin. From the leaked image we've seen of the interior, the Defender will borrow styling cues from other Land Rover models with a focus on simplicity rather than elegance. 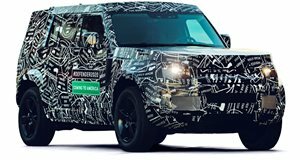 Don't think this means the Defender has gone soft because this SUV will still be able to handle itself offroad, just using different technologies than before. "It’s a combination of the basic physical things as well as having the right technologies,” said Pete Simkin, vehicle program director at JLR. "You need both geometry and the clever technology to support it.” While some fans of the original Defender may not be excited by change, we are happy to finally have the Defender back in the US after such a long hiatus.